York Castle Museum is one of the best city museums we’ve ever been in for a number of reasons. The place is huge, with two large buildings forming the main museum and a water mill in the gardens. Also, we liked how many things are not behind glass cases, although there is further to go with this in the building which used to be a prison. But, mostly we liked this museum because of the huge replica of a Victorian street complete with traditional shops. It’s called Kirkgate and was originally built in 1938, but has now been updated. Every single shop is based on a real York business from times gone by and there are costumed guides who ‘work’ in the street and will talk to you about their lives when you enter each shop. One of the new features on the street is an alleyway called Rowntree Snicket which paints a picture of the poverty in parts of Victorian York. It includes a working class home from the era, which is fully furnished. The key thing to remember when visiting the street is not to rush through it or you will definitely miss something! There really is a lot to see here. Don’t forget to pick up a copy of the Kirkgate Newspaper which has more information on each shop or business. You can buy a sugar mouse, explore the apothocary and visit the carriage stables. The whole thing was really well done. Away from Kirkgate, there are some fascinating period sitting rooms laid out as they would have been at certain points in history – we liked the 1950s front room best! We also enjoyed the displays on vacuum cleaners and washing machines over the years. A highlight for us was the exterior water mill at the rear of the museum which has just been restored to working condition. You can go inside and watch the mechanism turning and the gardens on a sunny day are beautiful. There’s also a great 1960s experience which is another mini street scene and from therer you can take a trip into the old prison cells too. 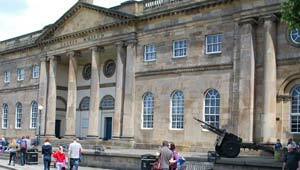 York Castle Museum opens daily from 9.30am until 5pm. Adult admission is £8.50 but children under 16 get in for free (2012 prices). Adults can also get in free with the York Pass.